The upcoming NATO summit in Warsaw is an ideal entry point for the United States to actively engage Poland on PiS’s undemocratic reforms. Read more. I was thrilled to be headed back to Gdańsk again. Something about the flat, Germanic facades and the history of Solidarity, arguably one of the most influential social movements of the 20th Century, invigorated me. Łukasz (my second cousin once removed, a “close relation,” according to my mom) and I sped along Highway 1, recently completed for the 2012 EuroCup. Like many things I noticed since touching down in Warsaw (the welcoming pink placards and shiny glass everything at Chopin Airport, the presence of multilingual signs, cleaner, brighter public spaces), so much of Poland’s infrastructure had been positively influenced by EU funds. Since my last visit, three years ago, Poland had become noticeably more European. Just as I remembered, the shipyard cranes soon peaked up above the horizon. The features of the lively city — blocks of flats, billboards for new, Western-style shopping malls, and the outline of the Old Town — began to appear. We parked and set off on foot in the direction of the Old Town’s main market. Thanks to the annual St. Dominic’s street fair and a brisk but sunny August day, the downtown was teeming with tourists and consumerism. Tents selling tiny, hand-painted cat figurines, trendy clothing, World War II-era antiques, and plenty of food snaked along squares, side streets, and the waterfront. “She’s pretty good,” I said to Łukasz, who was about to snap a photo of her. And then I realized that she wasn’t your average child street performer. Maybe it was her hair that had thrown me off. Maybe it was because we were in Poland, in Gdańsk. But there she was. A blonde, Polish-speaking, accordion-playing gypsy. Łukasz decided against taking a photo. “As a photographer, it’s hard to walk by something like that,” he explained, “but you don’t want to perpetuate it.” I tried to wrap my mind around what he meant, but I had a hard enough time looking ahead as we walked toward lunch. Strains of the little girl’s melody kept making their way to my ears. Curious. Two gypsy sightings in one day. In Russia, I had two sightings over a period of six months in a crowded metro car. And then I became aware of a presence behind me. No–three presences. Three young girls had wedged themselves between the back of my chair and the table next to ours. They stood behind me silently, palms outstretched. They stood so close I could feel their breath on my neck. A waitress came by and they scurried away, repeating the process at other tables and restaurants along the waterfront. After about a half hour of this cat and mouse, an argument erupted between the group of girls, their mother, and the waitress. The oldest daughter was yelling and cursing (in what was perfect Polish to my ears) at the waitress, who was threatening to call the police. The girls’ mother joined in, screaming in her accented Polish, turning heads all along the waterfront in her direction. The oldest daughter defiantly stuck her hand out and honked the waitress’s right breast. The waitress, turning a deep shade of red, took a deep breath and ordered them away. The family walked down the waterfront and out of sight. These experiences seemed anachronistic in the “new” Poland I had observed over the past few days, but with European status come European problems; namely, how to respect the human rights of a population you would really prefer to not have around. Poland’s Roma intolerance extends past the denial of basic social and welfare services. As reported by Amnesty International, in April 2013 the city government of Wrocław notified the local Roma population that it would be evicted from an informal settlement housing more than 60 people, including children. In a letter to the mayor, community representatives underscore their attempts to assimilate, and desire to remain Wrocław residents: “We feel a part of this city. We have nowhere to go. Can we ask you to let us settle somewhere else in the city?” In early May, Polish Radio reported that the eviction decision lay with the city court, though if affirmed, the city would offer social housing alternatives for the community. Poland is hardly the only EU member state that has had difficulty reconciling its European identity with fair treatment of its Roma population, nor is it the state with the worst record. But events like those unfolding in Wrocław mar Poland’s image of the democratic Eastern leader that it tries so hard to project. After spending a week in Bosnia and Herzegovina’s wealthier, more tourist-oriented neighbor and crossing a border that didn’t exist 18 years ago, I couldn’t put my finger on what I expected to find in BiH. It was doing well enough to accept buses full of gawking tourists on a daily basis, but, unsurprisingly, not well enough to warrant EU membership. As we neared Mostar, the largest city in the Herzegovina region, the ethnic and religious diversity of the country — and reminders of all it had wrought in the past twenty years — were evident even from the highway. A yellow and black road sign flew by with one of its lines spray painted to oblivion. I automatically assumed (perhaps in true New Jersey style?) that there was construction in that direction, or that perhaps the exit number had changed…until I saw another sign like that. And another. Finally we passed a sign with all its lines visible; those that had been blacked out were written in Serbian, which uses the Cyrillic alphabet. 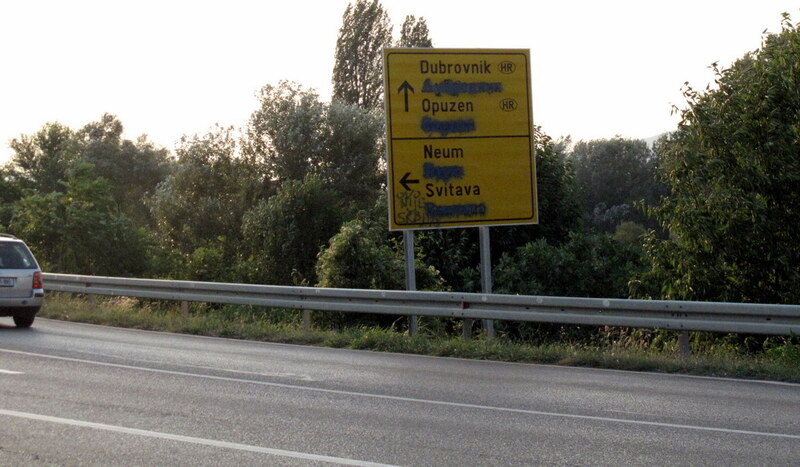 Though Serbian is one of BiH’s official languages and road signs reflect this fact, Serbs are viewed by Bosniaks and and Bosnian Croats alike as perpetrators of the Yugoslav conflict. Though citizens of BiH and Croatia can agree on little, their hatred of Serbia is one concept that unites them. As if on cue, our guide gave a superficial account of the Dayton Accords and the end of fighting in the region. “Though the leaders signed some documents, not everything is fixed in Bosnia.” She flippantly explained that Bosniaks, which is “the name Muslim Bosnians gave themselves,” and Croats still don’t get along. “Many refuse to even cross into the part of town where the other side lives… they’ll only do it if they really have to.” She warned us not to believe everything we heard from our local guide. “Sometimes they are biased and lie,” she added, as if she were free from such an affliction. Despite the ethnic and religious tension still palpable as we entered the city, our local guide, a Mostar native, described the city as lacking a specific religious or ethnic identity, because it exists “for those who live there, no matter their background.” I wondered what our Croat guide would think of that. 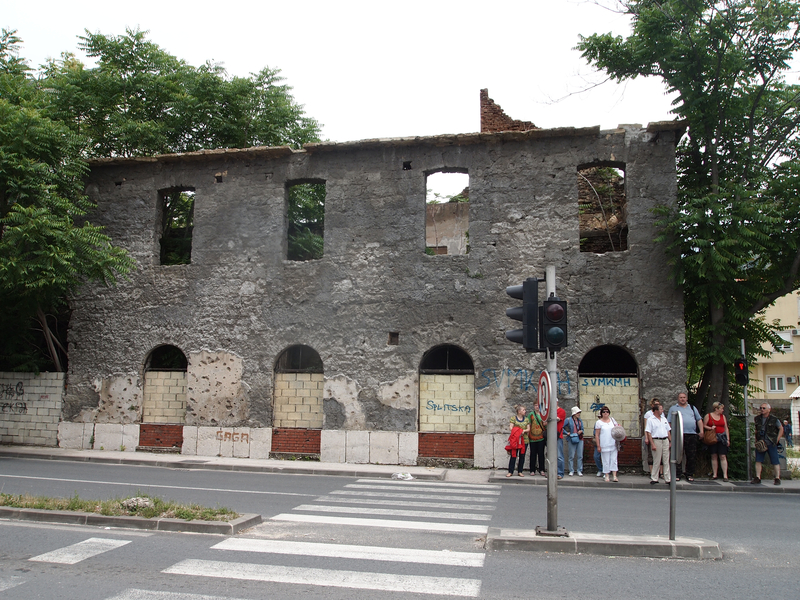 Mostar seemed to embrace its diversity and history — even the recent, ugly stuff — in a way that Dubrovnik did not. It put uncomfortable topics at the forefront, perhaps because it can neither hide nor repair the war ruins that still dot the town. It needs to explain why pieces of the iconic Old Bridge, once a symbol of the town’s unity that was destroyed by Croat forces at the end of the war, are visible on the bed of the Neretva. And so it styles itself as a land of contrasts and crossroads between East and West, Islam and Christianity, Communism and Capitalism, Good and Evil. And it does it through souvenir shops. 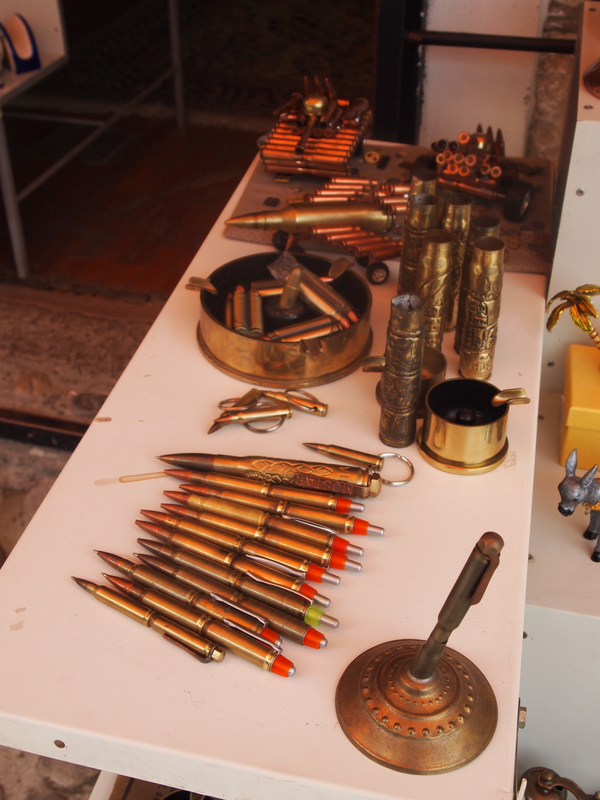 If you didn’t realize that war had touched Mostar before you arrived, you’d have no doubt once you saw the various trinkets made out of bonafide shell casings available for purchase. You might not have known that Yugoslavia was a communist country — it cut ties with the Soviet Union, after all, so how communist could it actually be? 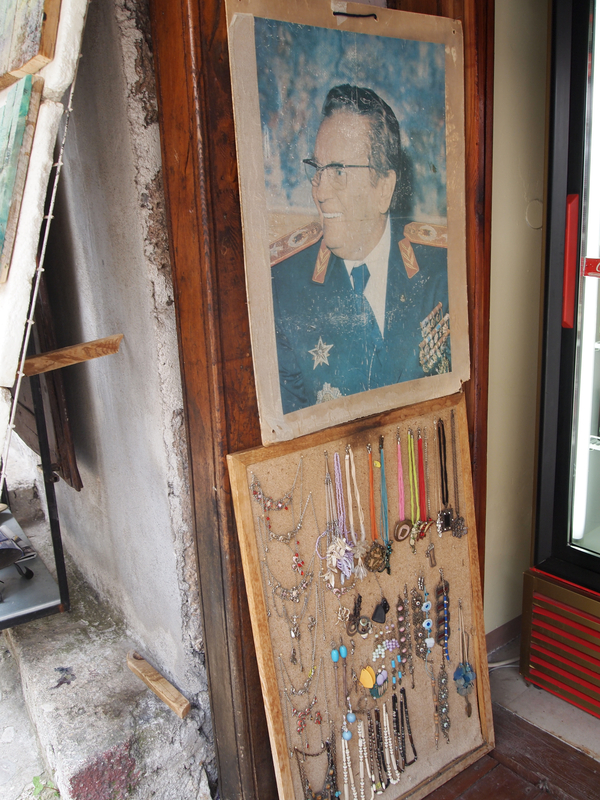 Answer: as communist as jolly old Josip Tito, President of Yugoslavia. And you’ll practically be an ethnographer after you peruse the offerings of a t-shirt shop in Mostar. Either that or you’ll think you’re in the Little Mostar section of some Jersey Shore boardwalk. 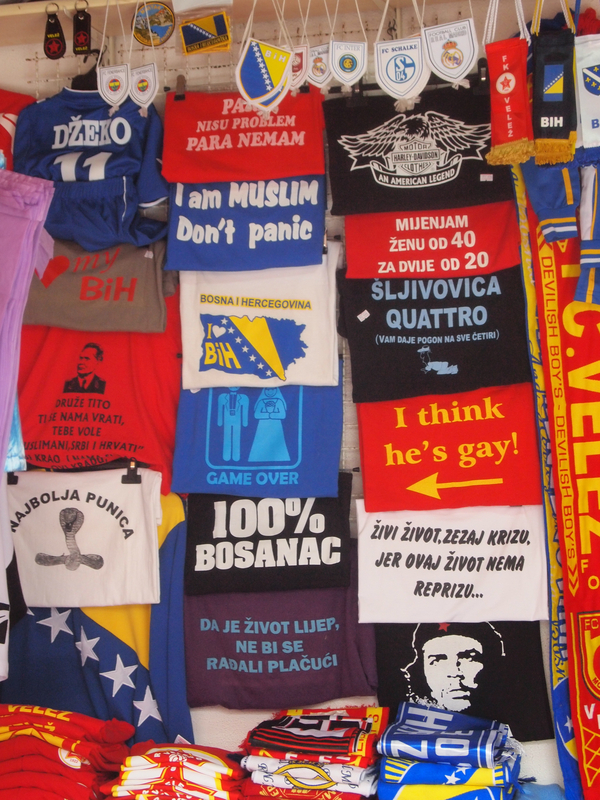 A selection of ethnic and boardwalk-style tshirts in Mostar. Bosnia and Herzegovina is undoubtedly still recovering from violent conflict nearly 20 years after the Dayton Accords, and relations between ethnic and religious groups remain strained. 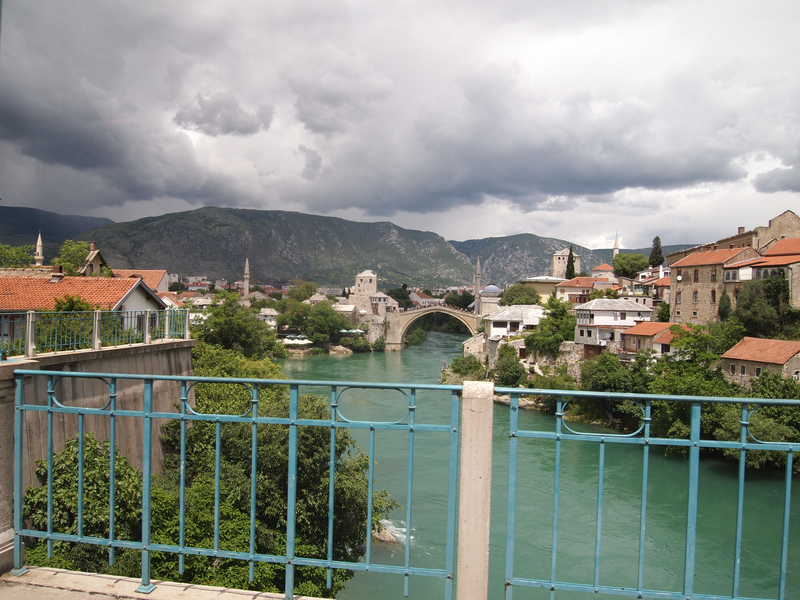 Even so, BiH, with its veritable melting pot of Balkan identities, seems to represent itself in a more truthful, self-aware way to those willing to hop on a minibus, cross three borders, and amble around the cobblestone streets of the crossroads of Mostar. When I look at a map of the Balkans, I am always struck by how small the area is, and how so many ethnicities, countries, and conflicts might be squeezed into it. Given my fascination, it would be silly not to hop the border into Bosnia and Herzegovina (BiH) for a day while we were honeymooning in Croatia. 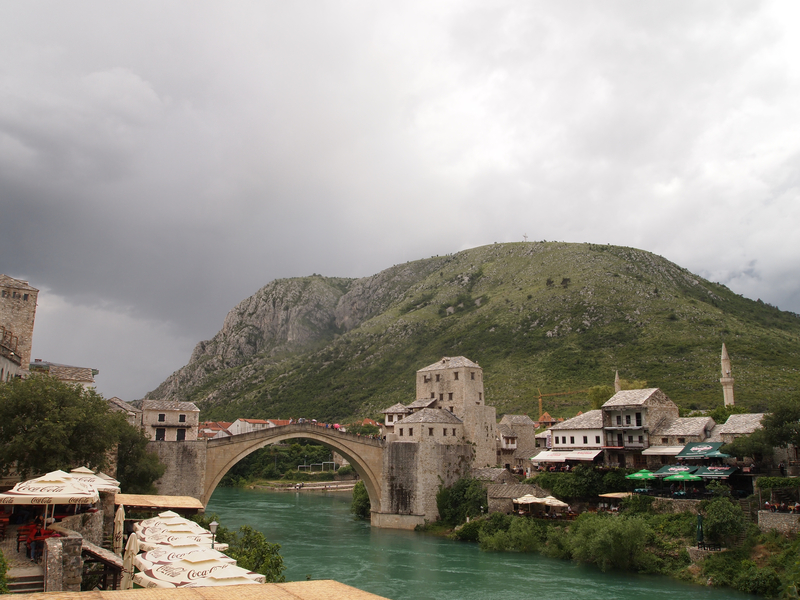 We chose to visit Mostar, and to do so we had to cross three borders in each direction, due to Bosnia’s historically-preserved sea-access surrounding the town of Neum. We were in Bosnia for just a few kilometers, and the border crossings in and out of the country were no more than glorified toll booths. We rolled through the crossing slowly enough to get a glimpse of the guards sitting in the police booth that straddled the border. On one side sat a Croat, on the other a Bosnian. They looked like brothers. They also seemed to be equally bored. A few hours later, we were at the “real” border crossing, though it looked like no more than a ramshackle barracks, a chain link fence, a cafe for waylaid travelers, and an obscenely long line of would-be border crossers. A surreptitious picture of the crossing from the minibus. It just looks like a bunch of cars, because that’s what it is. The border crossing was uneventful in that we sat in our stuffy minibus for nearly an hour while our guide, passports in hand, took care of business on the ground. What it entailed, I’m not sure, as my passport carries no evidence of crossing the Croat-Bosnian border once, let alone six times in one day. 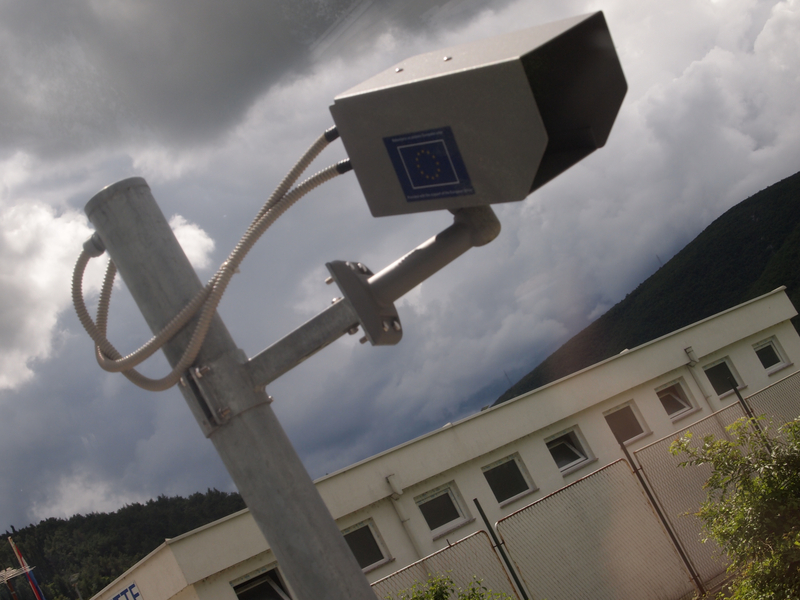 But there are some indications — cameras and other digital technologies provided with EU funds — that come July 1, this border will cease to be just a fence between two former Yugoslav brothers, and become a border separating the free and prosperous from the oppressed and desolate. 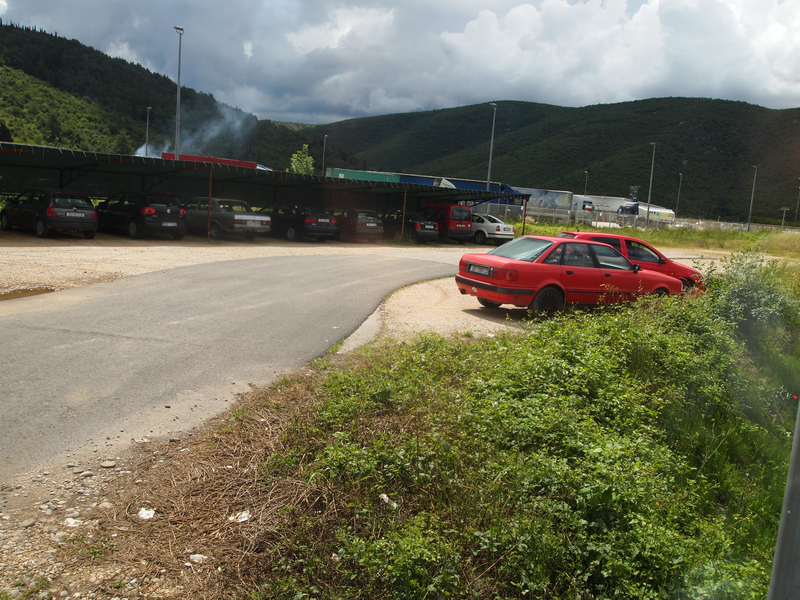 After Croatia’s EU accession, the lines at this border will grow longer, the fortifications stronger. The irony, of course, is that the border separates two peoples that lived together for centuries, speak essentially the same language, and share many of the same customs. It was manufactured by politicians, elites, and ethnic entrepreneurs. And the normal citizens are those affected. The difference between BiH and its more prosperous Croatian comrade is evident just a few kilometers from the border. Subsistence agriculture seems to feed the countryside; small, family-owned farms with a cow or two line the roadway. Farmers sit at booths by the road peddling the best of their small crops. Desolate shells of one-room homes whiz by occasionally, and its hard to tell if they deteriorated over time or were casualties of war. Whatever the reason, there is a palpable struggle across the border, not to catch up, but perhaps to finally recover and simply exist. When I told friends and family I was going to Croatia on my honeymoon, they mostly responded with blank stares. I tried to clue them in. “It’s part of the former Yugoslavia,” I said. They reacted with panicked looks and questions about our safety or whether there were even beaches in this dangerous faraway land. I started to wonder whether I had made some terrible mistake, but as our tiny puddle jumper descended below the cloud cover, the sparkling sea and the walled city of Dubrovnik, “the pearl of the Adriatic,” were laid out below, just as the maps had depicted. 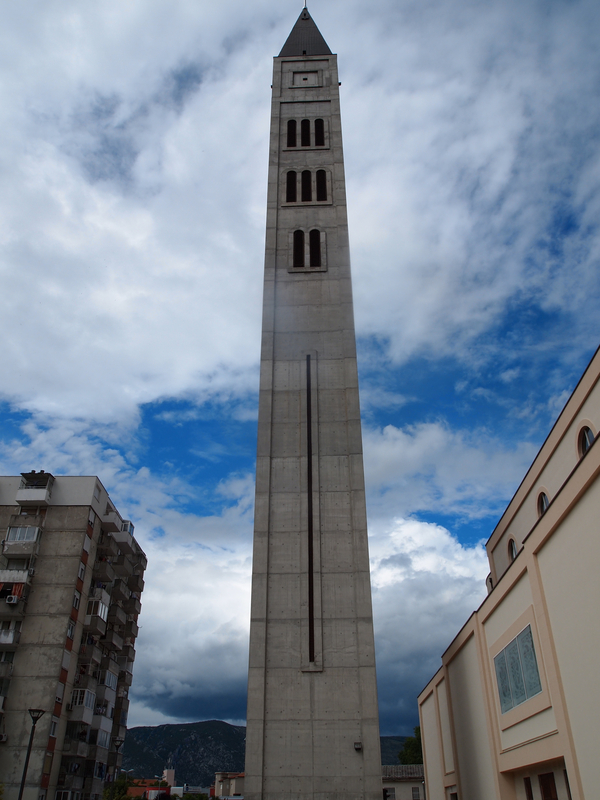 My experiences in Croatia were decidedly touristy – I was on my honeymoon, after all. But I was newly-armed with a Master’s degree that focused on post-communist Europe, and I was fairly determined to acquaint myself with the side of the country that might not be found in the average tourist’s guidebook. In one week, I was going to talk to everyone, try everything, and get to the bottom of Croatian identity as it related to Yugoslavia and the EU. Oh, and I was going to take my husband along for the ride, because what part of the violent breakup of one confederacy, twenty years of rebuilding, and the joining of another doesn’t scream everlasting love? Finding Croatia – even in a wholly superficial, tourist-oriented way– proved more difficult than I imagined. The typical “easy” entrances to a foreign culture, food and history, are discolored by a somewhat forced pan-Europeanism complemented by the country’s confused set of conquerors and alliances throughout its existence. Based on its history (and the in-flight Croatia magazine provided by Croatia airlines), Croatia could easily be categorized as the most European country in Europe. Dubrovnik and its environs claim Greco-Roman heritage – Odysseus is said to have been shipwrecked on the island of Mlijet, and canals from the Roman era still flow in the Konavle region today. Later on, as the city became a maritime trade hub, the Republic of Ragusa (as Dubrovnik was then known) had close ties with Italy; Marco Polo was born on the island of Korcula. Napoleon took the city just before it became a part of the Austro-Hungarian empire and all the European grandeur it signified. On the ground, the situation is the same. When you sit down at a Croatian restaurant, you may as well be in Italy. Pasta, risotto, and stone-fired pizzas adorn the menu, complimented by simply-prepared local fish dishes, which, while mouth-wateringly fresh, do not offer insight into what is considered thoroughly Croatian cuisine or custom. You are waited on by an array of attractive but detached young people with perfect English. They are interested in giving you a pleasant European experience, not in discussing the efficacy of the Croatian government or the merits of EU membership. Croatian tourist attractions focus on the natural and historical beauty of your surroundings, without providing any detail of their origins. Guides acknowledge that this fort or that church was built by X, Y, or Z historical figure, but the way these landmarks figure into the recent history of Dubrovnik is glossed over in order to give preference to the popular pan-European myth of the Croatian Republic. My mom thinks that my first piano teacher was picked for me because his name was Slavic. The administrative staff at my conservatory thought that we would have a natural rapport. Somehow, though we’d be speaking English, the fact that our families’ mother tongues were mutually intelligible would not only aid our own communication, but help me rise to the ranks of his favorite students. Obviously. My memory of my first lesson is a little fuzzy, but I do remember the first exchange we had with my teacher. My mom and I walked into the dimly-lit, circuitous bowels of the conservatory where I studied and found my room. A scared-looking preteen scurried out as soon as the door opened, leaving my teacher, dressed entirely in black, with a scruffy head of similarly dark hair, framed by the door. Dr. K (as his students called him, since his two-syllable name with an unfamiliar consonant cluster clearly required too much effort for the untrained American tongue) looked unimpressed, and told us he was from Bulgaria. Then my first lesson began. Our inauspicious beginning wasn’t a fluke. Since I wasn’t the most committed student and Dr. K hadn’t lost his communist-style relationship to music and its performance, our efforts never really jived. After lessons, I would laugh with my mom about how he sometimes suddenly exclaimed “Heeere eet eez!” after my tenth repetition of a difficult passage. Or about how he needed to clip his nose hairs. Given that I’ve ended up a total Slavophile, sometimes I wonder what went wrong with me and Dr. K. Less than 10 years after Bulgaria became an independent, seemingly-democratic country, was he offended to be continually lumped in with other post-Communist countries like Poland by uninformed but well-intentioned westerners like me and my mom? I would wager that he got asked by at least a few of our compatriots if he had seen Dracula, even though everyone’s favorite vampire is from Romania (and, needless to say, fictional). If I saw Dr. K today, what would he think about the interest I’ve developed in “his” region over the past 14 years? Would we speak Russian and Bulgarian and get along, or would I offend him by even suggesting such a thing? 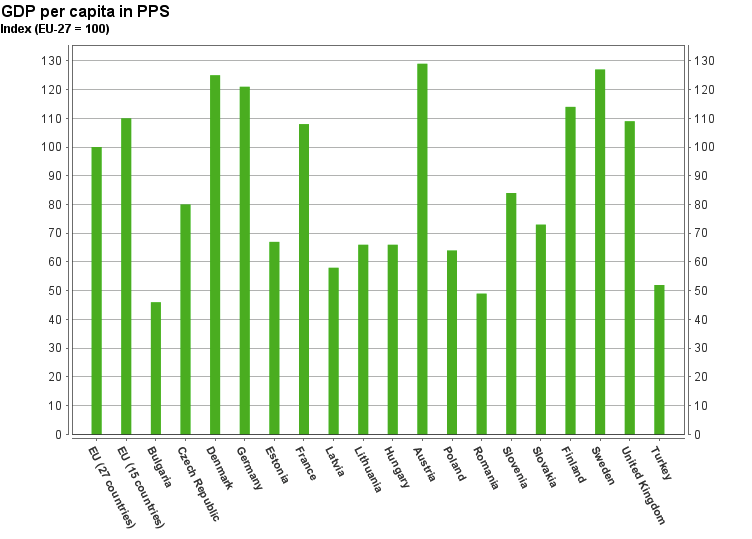 Bulgaria’s GDP as compared to other EU countries. Via Eurostat. I think of Dr. K every time I pour myself a drink; our glasses are from IKEA and were made in Bulgaria. I wonder if Bulgaria’s 2007 EU accession has changed his defensiveness about his identity, or if, like his government and the rest post-communist Europe, he is struggling to define exactly what it means to be both European and Eastern.